Plans have been unveiled for a brand new London venue that, if built, would rival the likes of the O2 and Wembley arenas. The spherical arena, a project by the same company behind New York's Madison Square Garden, would be set for the grounds of London's Olympic Park in Stratford and would house 18,000 seats along with room for 5,000 standing audience members. Last week, during an event at Manhattan’s Radio City Music Hall, The Madison Square Garden Company (MSG) unveiled designs for a similar venue planned for Las Vegas and announced that it was the company's intention to bring an arena of similar design and size to London. 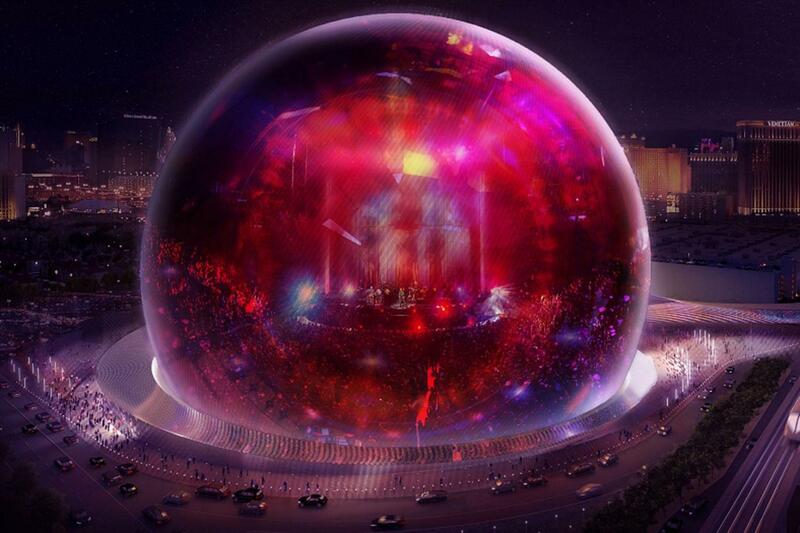 If plans go ahead, the "Crystal Ball" venue will be built with technological features never-seen-before in UK spaces. Its audio set-up would allegedly be designed in such a way as to target each audience member individually and there would be the capacity for Augmented and Virtual Reality style events as well as the outer structure of the dome being adaptable to screen live events or displays. The five-acre plot set aside for the venue's construction is located near the grounds of Olympic Park in East London, near Westfield shopping centre. It was bought for £60 million at the end of last year. The 320 ft tall venue would not only host music events, but also sports, gaming and other conferences. This would be MSG's first venue outside of the U.S. and it is claimed that it would create 3,200 jobs annually and bring £2.7 billion to the UK's economy over the course of 20 years. “London is one of the world’s greatest cities, and we are delighted to be taking this first step towards making it the location for MSG’s first international venue," said MSG’s executive chairman and CEO, Jim Dolan as reported by Music Week. “We believe that a large-scale, next-generation venue will not only become a premier destination, but also drive growth in London’s overall music and entertainment market -- benefiting artists and fans, and serving as a long-term investment in the future of this incredible city." Eyebrows have been raised concering the fact that Dolan is known to have donated generously to Donald Trump's presidential campaign. As reported in The Guardian, when London mayor Sadiq Khan was approached to give a comment on his supporting of a venue with these dubious connections, a source close to him said that planning decisions were not taken on the basis of their applicants’ political views. It's an ever-changing environment for venues in the UK at the moment with a new 3000 capacity venue opening in March and the iminant return of Printworks just around the corner.